Published Monday, April 9, 2012, OK personal/derivative use; link www.lovethatimage.com. Visiting the New York area last week, I got to travel a bit around the Greenwich, CT area. 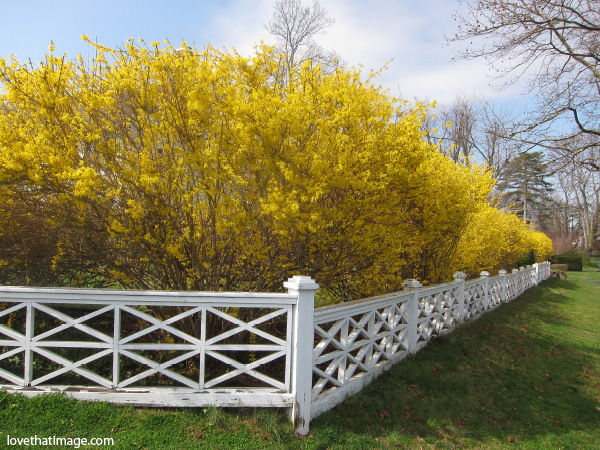 With a spring landscape that can’t be beat, bursting into bloom from the warm weather they’d been having, I was in photo heaven when I saw this forsythia hedge just exploding in front of me. The sun peeked out and snap! I got it. Lucky me! Check out more nifty photos at Mellow Yellow Monday, Shadow Shot Sunday 2, Today’s Flowers, Weekend Flowers, Floral Friday, Outdoor Wednesday, SOOC Sunday (straight out of the camera), A Piece of Heaven, Skywatch Friday and Scenic Sunday. If you’ve arrived via a link, click on Sara’s Fave Photo Blog above for the complete selection here. 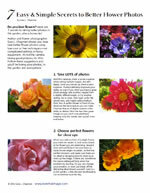 Please follow this blog on the new widget to the right if you enjoy the photos. Thanks for visiting! Wonderful job with the sun and golden colors in the leaves. Great shot, love the Yellows.. The gold and the contrasting stark white detail of the fence line together create a wonder of streetscape beauty! Stunning photo! I love forsythia and that’s such a beautiful one. Great shot! I love the yellow awesomeness. Nature certainly rocks!